"May the blessing of Lord Krishna beautify each moment of your life. This Janmashtami and always"
The birthday of Hinduism's favourite Lord Krishna is a special occasion for Hindus, who consider him their leader, hero, protector, philosopher, teacher and friend all rolled into one. Krishna took birth at midnight on the ashtami or the 8th day of the Krishnapaksha or dark fortnight in the Hindu month of Shravan (August-September). This auspicious day is called Janmashtami. Indian as well as Western scholars have now accepted the period between 3200 and 3100 BC as the period in which Lord Krishna lived on earth. Read about the story of his birth. How do Hindus celebrate Janmashtami? The devotees of Lord Krishna observe fast for the whole day and night, worshipping him and keeping vigil through the night while listening to his tales and exploits, recite hymns from the Gita, sing devotional songs, and chant the mantra Om namo Bhagavate Vasudevaya. Krishna's birthplace Mathura and Vrindavan celebrate this occasion with great pomp and show. Raslilas or religious plays are performed to recreate incidents from the life of Krishna and to commemorate his love for Radha. Song and dance mark the celebration of this festive occasion all over northern India. At midnight, the statue of infant Krishna is bathed and placed in a cradle, which is rocked, amidst the blowing of conch shells and the ringing of bells. In the south western state of Maharashtra, people enact the god's childhood attempts to steal butter and curd from earthen pots beyond his reach. A similar pot is suspended high above the ground and groups of young people form humans pyramids to try and reach the pot and break it. The town of Dwarka in Gujarat, Krishna's own land, comes alive with major celebrations as hordes of visitors flock to the town. 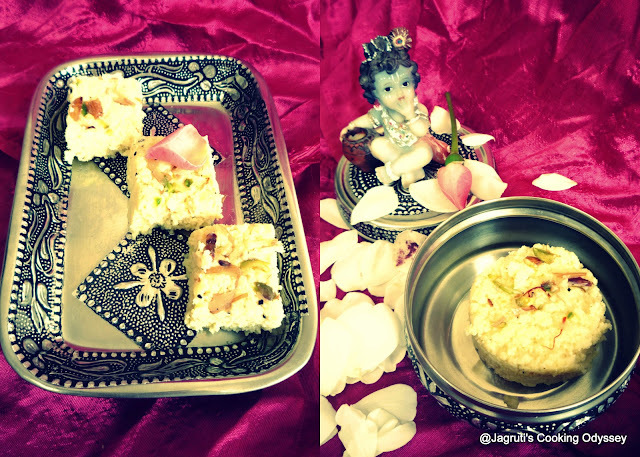 I have prepared Kesar Kalakand for my Bal Gopal as Baby Krishna loves dairy products. So to keep him happy I've offered him a Milk based sweet. Also as we keep a fast today, we can consume this dish too. Kalakand is one of the favourite dish in my family. 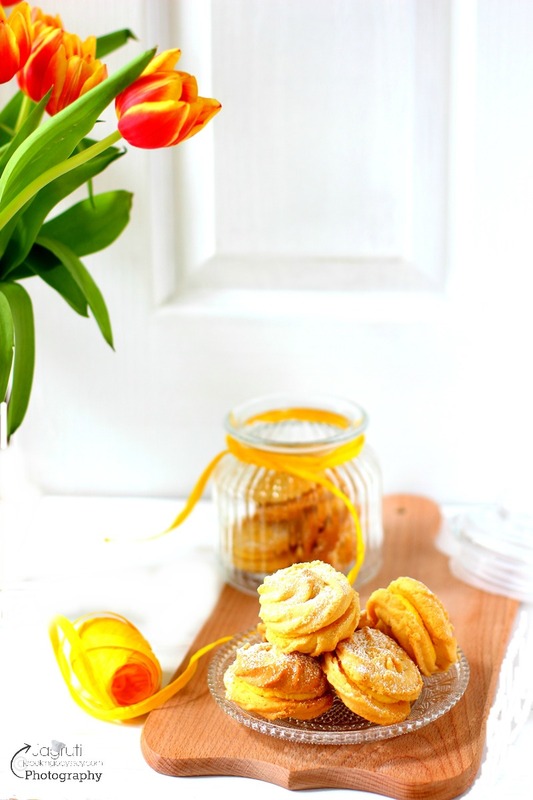 This reccipe is obviously very traditional, but I want to try it out one day by adding chocolate giving this authentic sweet a complete make over..!!! In a M/W proof bowl place cheese and condensed milk. Blend them smooth with whisker. Keep an eye in between on the mixture. After 5 minutes, remove bowl from the M/W, give it a good stir and put it back in the M/W for another 5 minutes. Keep a close eye on, it might get boil over. In between you can pause the M/W and give it a good stir. After 10 minutes mixture would be thick and grainy, add saffron threads into the cheese mixture and cook further 5 minutes. At this stage you can checking every one or two minutes and stir the mixture. Kalakand should be done after 15-17 minutes, texture should be grainy but with little moisture. Transfer the mixture into the greased plate evenly, sprinkle the chopped nuts on top of the mixture and pressed slightly with the spoon. Let it cool at room temperature, then leave it in the refrigerate about hour or so. Cut kalakand with knife into any shape you prefer. Celebrate - 15th August guest host by Geetha Nair. ( I have used saffron, pistachio nuts and almonds to create tri colours of Indian flag. Looks so delicious and my fav. sweet. Nice clicks. Kalakand looks absolutely delicious n very inviting!! Lovely pics! !